Our Service begins from the moment you contact us and we want you to be informed properly from the start. So knowing what your purchase will look like in your home is very important as outdoor lighting is completely different than indoor. 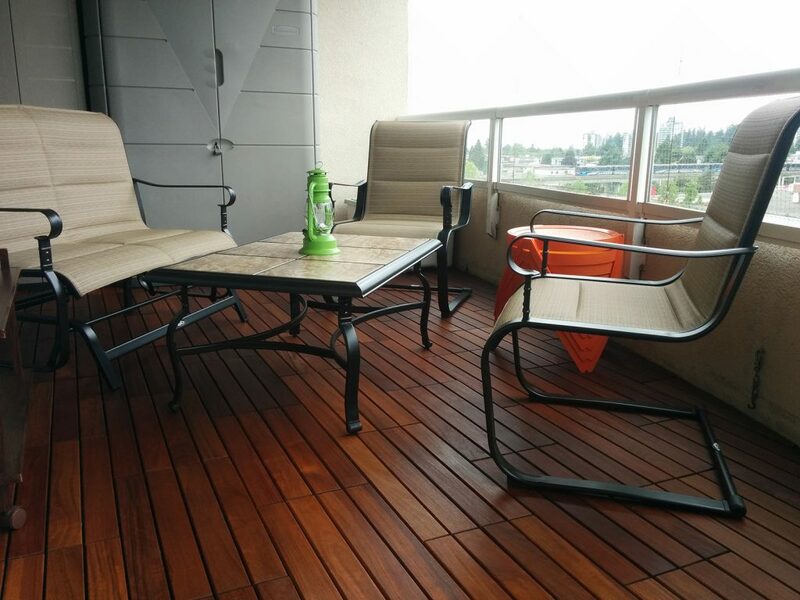 BC Outdoor Flooring brings our products to your home where you can see their true colour in your outdoor space. Where we will consult, inform and aid you in all aspects of your transformation. Together we can bring your vision to life. We will discuss your vision for your space, flooring design and style. Determine your needs and provide solutions that will fit your style and taste. Then show you the highest quality and best backed products on the market. And leave you with a Guaranteed Price. No other costs will be added for ANY reason. 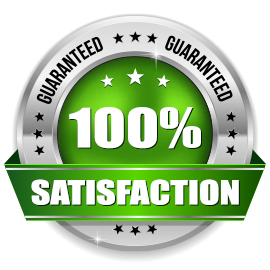 We will look after every detail and there will NOT be changes to that price. 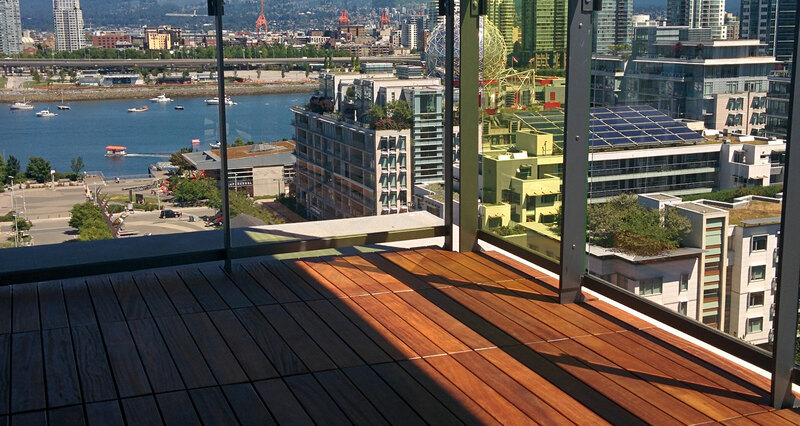 As Specialists, our innovative methods have culminated through years of experience and vast knowledge of materials. We have all the proper tools required to give that polished professional finish to your newly transformed outdoor space. Our Industry Leading Team has set the standards using these methods and we often exceed your expectations. From the moment we arrive, we protect your home by laying down vinyl runners from your entrance to the outside area. We take all the product and tools to the outdoor space first. Then our installation team leader will go over your Design Layout and put together a section of the floor to make sure you still like the layout you have chosen. When you see it laid out on a larger scale, you may re-think this, and we fully understand that. Other possible layouts will be shown to you and once you are completely happy with your decision, the work will commence. We then cover our work area with a tarp and cardboard underneath, protecting your new flooring and your railing. All work takes place on your outdoor space, minimizing any possible debris entering your home. Upon transformation EVERYTHING will be removed and the entire area vacuumed before we leave. Once you’re transformation has taken place, your new investment needs to be looked after and protected. We can tailor a maintenance service program suited to your needs and conducted around your schedule, or you can perform the maintenance yourself by following the instructions below. All hardwoods will fade to a soft silver gray over time with a smooth no splinter surface. Depending on the amount of exposure this could take years or a few months. 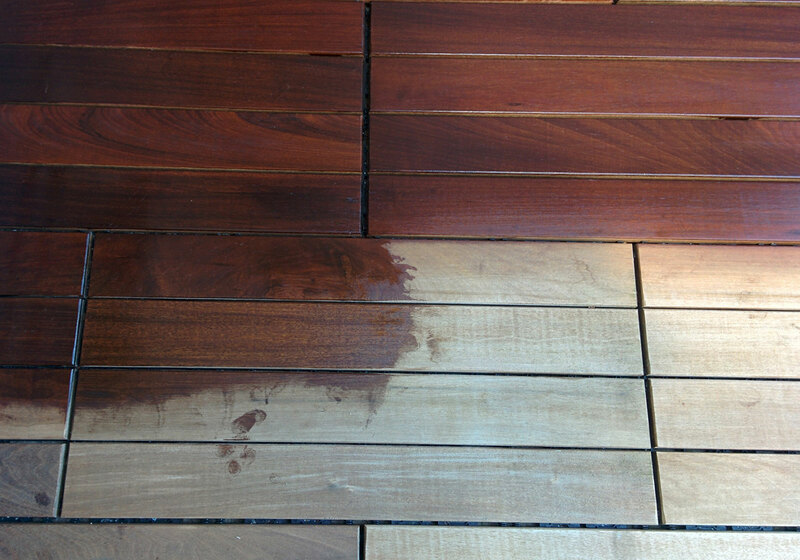 This is the natural patina that occurs with all hardwoods and their exposure to sunlight. Some of our clients love this naturally organic yet elegant and refined look. While most others prefer to keep or enhance the original color and grain of the lumber. Indeed both are beautiful finishes to enjoy, the choice is yours. 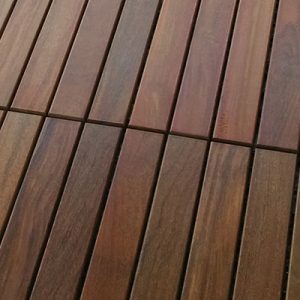 To seal your wood deck tiles with a good quality penetrating sealer such as Armstrong Clark mahogany or Amber semi transparent sealer is the best method. 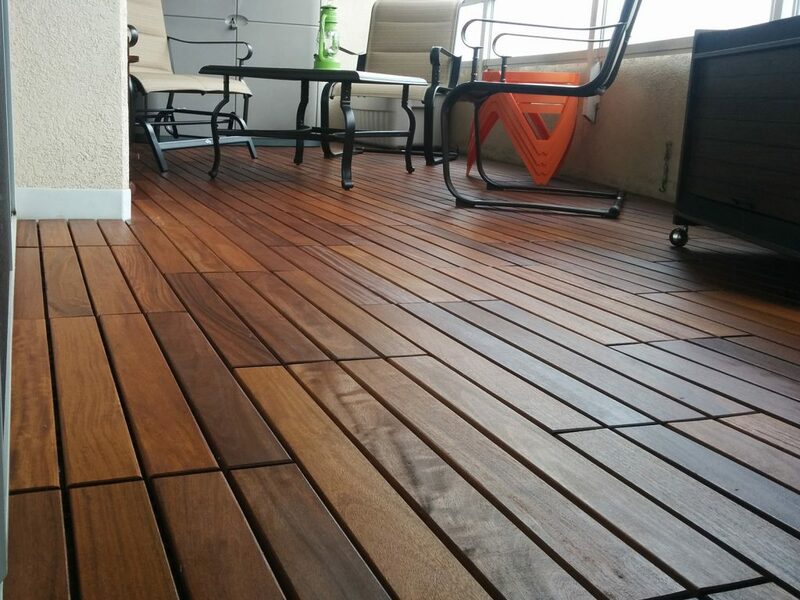 This will certainly darken or enrich the color of your deck tiles. Oil penetrating stain can be applied by spraying or a simple paint roller. Apply liberally and soak the tiles. If after 3-4 hours there are any wet areas, just wipe the excess with a towel. They obtain an average of 6-12 months of color from each application depending on sun and rain exposure. We can tailor a maintenance package for those with a busy lifestyle. Let us take care of your maintenance for you! 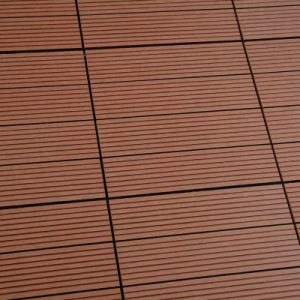 Our Porcelain Pavers can be power washed or mopped to clean off any type of dirt or film. Our Composite tiles have UV Protection built right in and should never need anything more than a light mopping, sweeping or vacuuming.